SEPTA police are seeking multiple participants in a brawl at the Broad Street Line's Race/Vine Station on Thursday, March 16, 2017. 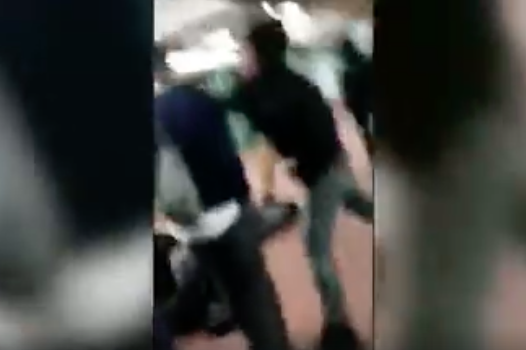 Ten teenage boys have been arrested for allegedly participating in a chaotic brawl inside a subway station last week, SEPTA Police Chief Thomas Nestel announced Thursday. Seven students were taken into custody when police served warrants Thursday at Benjamin Franklin High School, he said. Another student was arrested at Franklin Learning Center and another during a foot pursuit in North Philadelphia. The 10th student was apprehended during the news conference, and Nestel said he was not sure where that arrest took place. An arrest warrant is being finalized for an 11th student, who just turned 18 this month, the chief said. The students were charged with aggravated assault and robbery, Nestel said. A fire alarm was pulled at Ben Franklin High when police arrived on scene, but school personnel blocked doorways and officers were able to make the arrests, Nestel said. "It brings every student out of their classrooms and headed out the door," Nestel said. "A great, great tactic. It didn't work." The teenagers allegedly engaged in a fight on March 15 around 3:40 p.m. inside the Race/Vine Station on the Broad Street Line. The fight lasted several minutes and was captured on video. Five people sustained minor injuries during the fight, Nestel said. Several electronic devices allegedly were stolen from the victims, too. The victims did not know their attackers, Nestel said. Nestel said the fight is emblematic of a growing trend in which teenagers are fighting one another in the hours after school lets out. In some cases, Nestel said, students are traveling across the city to do so. "School dismissal time has become a period for youth violence," Nestel said. "We have kids causing pain and fear among other kids. Group think is overwhelming good upbringing and common decency." Nestel said transit police have met with several parents of the defendants who are "outraged" at the alleged actions committed by their children. "This isn't a case of kids with no parental guidance or example," Nestel said. These are decent kids who, in a large group, are losing control of themselves and doing things that they wouldn't ordinarily do. They're now facing felony charges because of them." In the near future, SEPTA officers will begin riding every train at school dismissal time. SEPTA also will launch a text line so youth can alert transit police to any issues. The alleged assault at the SEPTA station gained media attention because it was caught on camera, Nestel said. But other violent incidents are occurring elsewhere in the hours that follow school dismissal — they're just not captured on camera. SEPTA police also arrested six teenage girls on aggravated assault charges for another fight that played out Wednesday at 46th and Market streets, Nestel said. In that incident, a 13-year-old was stabbed multiple times with a knife and a 16-year-old had her hair burned by a lit aerosol can. "They're from North Philadelphia, Germantown and West Mt. Airy — it's not a neighborhood thing," Nestel said. "It's an entire city thing. They're traveling on SEPTA to go to other areas to jump kids as a group." Nestel urged parents to know where their children's whereabouts between 3 and 7 p.m. He also asked they remind their children that violent actions can result in felony charges that will impact their lives going forward. "We're making arrests for felony offenses, which can ruin the rest of their lives," Nestel said. "We would much prefer the kids are using the system to go to-and-from school, that it's a safe arena."